Course review: Is Arcadia Bluffs the top public golf course in Michigan? ARCADIA, Mich. -- Arcadia Bluffs Golf Club made two kinds of headlines as it geared for its scheduled opening in 1999. No. 11 at Arcadia Bluffs heads down toward Lake Michigan. To the golf community, the golf course was a godsend, a once-in-a-lifetime playing experience on the bluffs 225 feet above Lake Michigan. -- developers trying to make big bucks at the expense of the environment. The club has emerged from the scandal in 1998 that turned the course construction site into the worst erosion site in the history of the Michigan side of Lake Michigan -- and brought on a $425,000 lawsuit from the Department of Environmental Quality -- and developed into arguably the best public course in the state. The Rick Smith-Warren Henderson design, which plays 7,300 yards, just adds another feather in northern Michigan's cap as one of the most visually appealing golf destinations in the world. Sitting on a huge coastal dune, the links-style course provides stunning views of the lake. "The secret or the mystique (of Arcadia Bluffs) is it all looks so natural," General Manager Bill Shriver said. "When you look at it, it looks like it has been here forever. The land and the property lent itself to looking like a great links course." Co-owner Ron Vandanderpol, who runs RVP Development of Grand Rapids with partner Rich Postma, discovered the property on a drive home from a golf trip to Crystal Mountain resort in the mid-1990s. The original decision to clear the 80 acres of trees along the bluff turned out to be the best move for the golf course's views, and the worst move for the business. In April 1998, heavy spring rains and winds pelted the 245-acre site, overwhelming the water retention system and unleashing a torrent that swept a gaping ravine into the lake. According to state investigators, similar erosion occurred 12 more times in 1998, causing pollution and creating a peninsula in the lake. Since then, RVP has spent a reported $1 million to keep another incident from occurring. Meanwhile, players have flocked to the course, despite its out-of-the-way location off of M-22, more than an hour from the golf hotbeds of Traverse City, Gaylord and Boyne country near Bay Harbor. Arcadia Bluffs' commitment to a unique playing experience is evident in its amenities and its price tag. The golf experience at Arcadia Bluffs G.C. 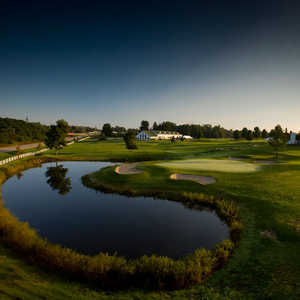 For example, the course instituted a caddie program this summer, one of the few public courses in the Midwest with one. If you're not up to walking, the carts are fitted with one of the best Global Positioning System yardage computers. Even the flagsticks and rakes have personality. The flagsticks are short, three-foot wooden poles and the elegant wooden rakes appear to be carved by hand. They are a testament to the severe weather the course can encounter. "Originally, we started with traditional fiberglass sticks, but the wind would just rip the cup out of the ground," Shriver said. Shriver said he's seen a wind chill of 45 degrees in the middle of July. "The conditions are consistently inconsistent," Shriver said. "You just never know what you are going to get. We can get four seasons in one day. We tell people when they call to prepare for anything." All of this -- the wicked weather, the dunes, the old-style rakes and flagsticks -- has players believing they're teeing it up in Scotland or Ireland, not Michigan. Like many quirky overseas links, Arcadia Bluffs doesn't have a traditional routing on the front nine, starting with a 519-yard par-5 and ending with a 240-yard par-3 over the washout of 1998, which transformed into quite a hazard. The course will change its routing in 2004, but the front nine will retain its character with three par-5s and three par-3s. Holes No. 1-7 will remain the same with No. 12, a 449-yard par-4, and No. 13, a 203-yard par-3, becoming No. 8 and 9, respectively. The new back nine routing is more complex, but No. 17 and 18 will remain intact. "This will eliminate some drive time in the carts and make things a lot less complicated," Shriver said. Scoring will always be complicated at Arcadia Bluffs Golf Club. The fairways are wide, some of the widest you'll ever see for such a challenging course. The danger lies in tough greens and dangerous bunkers. Some of the more than 120 bunkers are sod-walled bunkers so deep, they make the famous former "road hole" bunker in Scotland look like a picnic stop. Long fescue grasses are scenic, flapping in the wind, but also penal. "The golf course's defense is 50 yards and in," Shriver said. "The greens are difficult, large and undulating. If you look at the property as a whole, it's not flat. You won't get many even lies." No. 14, a 481-yard par-4, and No. 15, a 633-yard monster par-5, might be the two best back-to-back holes in the state. These two holes best display the course's beautiful natural dunes, which tower over either side of the fairway. Once the golf is over, the best part of your day might be eating dinner at The Sunset Grille inside the pro shop. Shriver doesn't mind working the long hours in summer, just because he gets a front-row seat at sundown every day. Oh yeah, and the food's pretty good, too. "It's the best view in the world," Shriver boasted. "I don't care where you go. I challenge you to find a better setting than dusk on the porch and the sun going down. When the sailboats are out and the clouds and sun are pink, it is just breathtaking. It's so peaceful. People come from all over the world just to see it."